Knorr4 – Blogher11 Recap…PLUS A GIVEAWAY! As you guys already know from my previous posts, a couple of months ago I entered the Knorr4 competition to come up with a recipe using Knorr’s new Homestyle Stock product. Lo and behold I made it to the final 8! 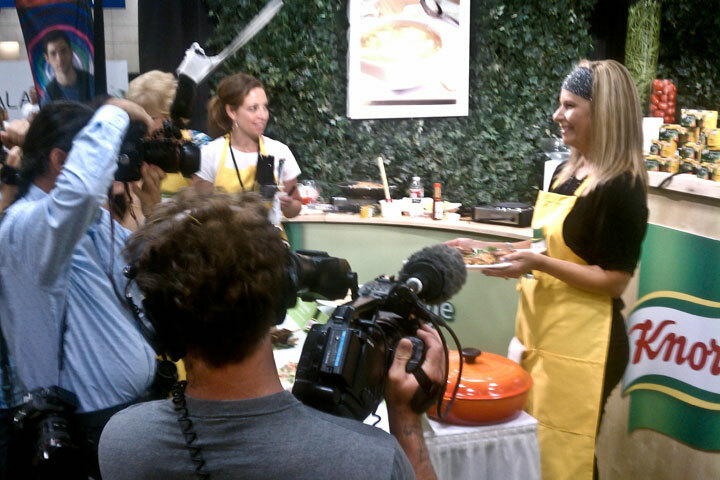 A few weeks ago I was whisked to San Diego to take part in a live cook-off with the other 7 finalists at the Blogher 11 conference. Gratuitous shot of my work station from my perspective. And the outcome of the event? I won! Wooooo Hooooo! Well, me and three of my other competitors won. 😉 For the next several months I have the opportunity to develop recipes using Knorr Homestyle Stock and couldn’t be more inspired. I mean, seriously, dude – how many different dishes can you dream up using stocks or reductions? Me – millions! Bazillions even! I’m already scheming up a mac-n-cheese dish that’ll be perfect for the tailgating season! This giveaway is open to US Residents age 18 or older and runs from 9/6 – 10/6. Head to the BlogHer Roundup Page for more chances to win. After checking out your site I had every expectation you would excel at the competition and Pierre’s compliment on your plating was no surprise either. 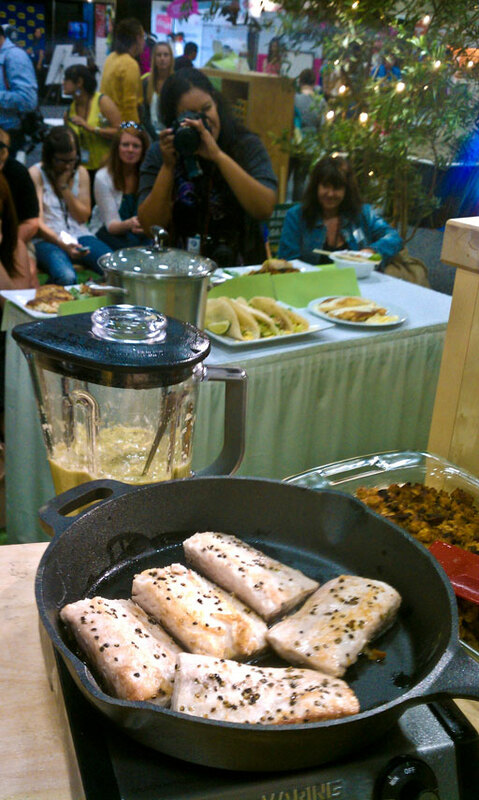 My mouth still waters when I think about your seared Mahi w/chorizo…yum! Will be looking at the Knorr entries. All the best to you. aw! thanks so much, cookie! can’t wait to see you and Jenny on Oct. 5th! You’ll be playing music right? Can’t wait to get to here you play! Goooooo, Amanda! Woo hoo! I knew you’d rock it out. My all-time favorite dish with stock is probably thanksgiving stuffing. CONGRATULATIONS (: you so deserve it! Woohoo! Way to take the gold! What an experience. Congrats! So happy to hear that you won! I’d love to use the stock for chicken pot pie. Gravy. Starting with stock is my secret weapon. And I end up with a LOT more gravy than if I just used pan drippings. My mom makes a delicious sausage stuffing with stock. That is so cool, I would love to have seen you rock that contest. Congrats! And my favorite recipe that uses stock..well it’s a toss up between Moroccan Chicken Soup and Sopa Verde con Pollo. Barley and lentil soup. My fav!! I’d like to make beef stew with Knorr stock. My favorite dish using beef stock is Beef Bourguignon. Flavorful and satisfying as the stock cooked up and concentrated into the sauce. 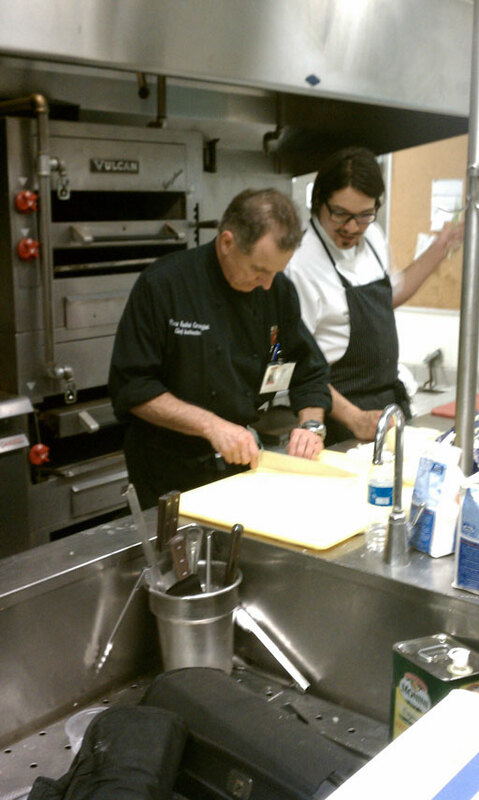 Sooo happy for you that you get to do what you love (Creating Fantasticooo recipes) from Puertoooo Ricooo. My fave dish made with stock is mos def Risotto baby. Favorite recipe with stock? Most def a Risotto. Here’s my tweet for your peeps. I could use this for my Grandmother’s homemade Chicken and Dumplings. Yumming for sure! id like to make chicken noodle soup ! I make a mean arroz con pollo and that requires good stock! I look forward to making Chicken and Wild Rice soup. We love white chicken chili with Knorr chicken stock. I make a ground turkey, veg soup using chicken stock… I just made it the other night and it was delicious! When I add knorr to my pot roast everyone loves it. I look forward to making brocolli soup with knorr stock. Thanks for offering this sweepstakes! my family’s favorite is mexican chicken soup which has a base of chicken stock and this homestyle stock would be wonderful in it. I am going to try a Chicken and Dumpling recipe that I just bookmarked in my favorites and the upside down chicken pot pie on the Knorr site. I like making any veggie soup with it! Congrats!! My recipe would be my dad’s famous Broccoli Cheese Soup. I could definitely use some of this in my Loaded Baked Potato Soup! Congrats! Love Knorr, was raised on it! At Thankgiving, I make this confit with fennel, chestnuts, walnuts and shallots. You poach the chestnuts in stock. It is super good. I use chicken stock to make Chicken and Dumplings. I use stock to make rice medley. My favorite recipe for the chicken stock is my baked potato soup. congratulations!! i’d love to try using chx stock in a layered polenta/blue cheese/wild mushroom terrine i make….usually just make stock from scratch, but this would be way easier, yum!! Congrats on your win!!! I usually make 2 of my fave stock-based recipes for large family gatherings: Old Fashioned Chicken and Dumpling Soup AND Beef and Barley Soup! YUM!!! My favorite is good old fashioned bread stuffing…yum! I would make my mother-in-law’s chicken & dumpling’s recipe. It’s one of my husband’s favorites! I have a chicken savory recipe that would be perfect with Knorr! I love cooking rice and quinoa with stock instead of plain old water. Thanks for the chance to win! Love the video! I have a favorite family recipe for braised chicken and olives that uses stock. I’d love to try the new Knorr stock! I love everything Knorr makes! Love Knorr, we use it all the time, Congrats! I use chicken stock for homemade chicken noodle soup. I use stock when I make French onion soup! I use chicken stock to make my Mom’s chicken soup recipe. Always wonderful for those chilly months. I use Knorr stocks when making any rice dish, especially when making my special risotto’s. It brings an amazing depth of flavor to each dish. Congratulations on you’re win! All of my chicken dishes always stat with stock. And I use knorr too. I used the new Knorr stock to make Tipsy Tenderloin … it was soooooooooo good! My favorite recipe for chicken stock is Broccoli and Cheese soup. Congrats on your win! I’m looking forward to using Knorr to make my mom’s chicken noodle soup as well as a recipe for black bean soup. Congratulations! I like to make beef and guinness stew with chicken stock. I love to make homemade chicken noodle soup and I bet it would taste fantastic with Knorr. Congrats! I would use this stock for my favorite chicken noodle soup recipe or maybe even lentil soup! I’d love to use this with my chicken pot pie recipe. I think I will try chicken with rice. My grandmother’s chicken paprikash recipe; my whole family loves it. 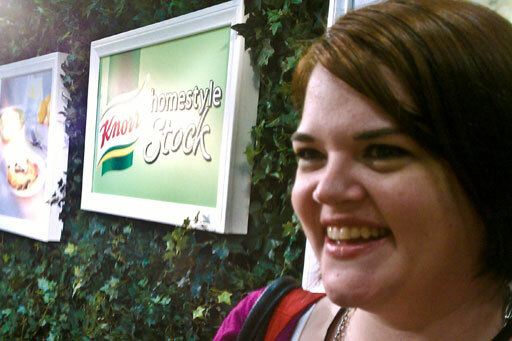 Would like to make some homemade soup with the Knorr Homestyle stock! Congrats on being chosen as one of the Knorr Four. I have used the Knorr Homestyle stock concentrate and find it to be terribly convenient. What a wonderful opportunity for you! Congratulations! I love the chicken version.. it makes everything taste better! Thanks for the chance to win! Crock roast is our winter favorite! Love Knorr products. Most recently purchased onion & garlic cubes. We love winter at our house because it means lots of homemade soups with Knorr! Yum. My favorite recipe that uses stock is my grandma’s chicken and noodles. It’s like a cross between chicken noodle soup and chicken and dumplings, and it’s mostly made by slow cooking chicken breast in a crock pot with stock, onion, celery, carrots, fennel, etc. and really wide egg noodles. She made her own noodles, I just buy dry. I HAVE A SECRET FAMILY CHICKEN DISH THAT USES STOCK! THANKS FOR THE SHOT! Making Grammy’s chicken noodle soup! Yummy! I’m going to try it with my home made chicken and noodle soup recipe. My mother in-law taught me how to make it about 25 years ago. I made some changes making in my own like using broth instead of water and boullion cubes. I’m excited to try this product. I think it will drastically reduce the number of cans I have to open! I think this would work well in my chicken pot pie recipe. I like to make good old chicken soup to freeze for over the winter months. Super easy…just chicken, chicken stock, bay leaves, salt, pepper, sage, some veggies and noodles and voila! Big batches are easy to make and freeze for multiple delicious meals! I’m kind of boring, I just use stock for soup. I love the new concentrated stock though, and I can’t wait to start trying it in new ways. 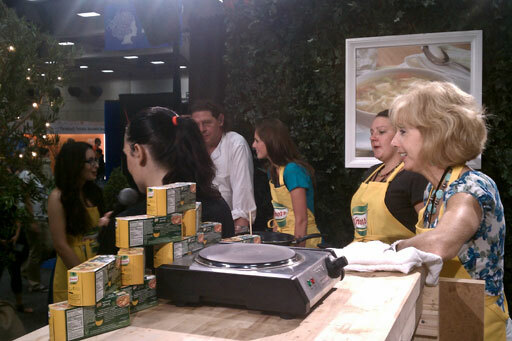 I love making Chicken & Dumplings with Knorr! My chicken and rice soup. I will use the chicken stock first in my Tortilla Soup recipe that our family loves especially with winter coming on and then use the beef stock in my French Onion Soup which is another favorite along with thin beef steak sauteed in the beef stock with onions and peppers on a sandwich for a quick movie night dinner. I love Knorr and all of its products. I love the new packaging for the stock! I would use it in so many dishes – pasta, chicken & veggie throw togethers; soups and more! Have used all of the Knorr products for home and commercial use. All have a place in the kitchen. Usually very high value to quality. Why so much sodium in these new stocks? These could be perfect for older or new cooks to add that extra boost to their menu item. Salt is a no no. One of my faves using chicken stock is Cranberry Stuffing. Fantastic giveaway. Thanks for the opportunity to win! i would love to try this with my chicken and cream cheese croissants it would be delicious i think. I like to make beef stroganoff which all members of the family enjoy. Finding something that everyone will eat is a fete in itself!! Chicken and dumplings sounds great! I make meatloaf using Knorr Stock. I use chicken stock in my Chicken Vegetable Noodle Soup. I love to make beef stroganoff, and the quality of the beef stock I use really makes a difference! MY fave recipe is Home Style Potroast! YUM! I wish I had found out about this product sooner, i just made 5 different soups an needed agood broth!